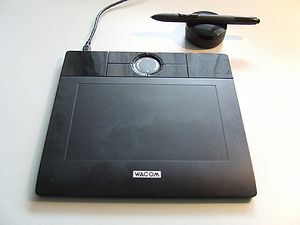 A Wacom "Bamboo" graphics tablet. Example of pressure control. 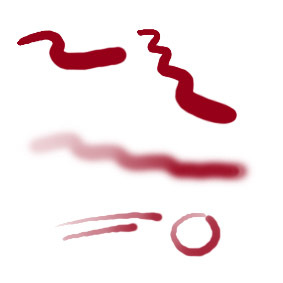 Top: affect brush size, center: affect opacity, bottom: affect both size and opacity. A graphics tablet (also known as a digitizing tablet, graphics pad, drawing tablet, pen tablet or pen pad) is a computer input device that allows one to hand-draw images and graphics similar to the way one draws images with a pencil and paper. It replaces the usual computer mouse (or other pointing device) for this purpose; some tablets are intended as a general replacement for a mouse. Often, one can have both a mouse and a graphics tablet connected simultaneously and use whichever suits the task at hand best. A graphics tablet consists of a flat surface upon which the user may "draw" an image using an attached stylus, a pen-like drawing apparatus. The image generally does not appear on the tablet itself but is displayed on the computer monitor (so the user will not watch the tip of the stylus, as in drawing on paper, but rather watch what he or she is doing on screen). Graphics tablets are available in various sizes and price ranges; A6-sized tablets being relatively inexpensive and A3-sized tablets being far more expensive. Modern tablets usually connect to the computer via a USB cable. Graphics tablets are much better suited to the task of drawing than other computer pointing devices. They are well-suited both for the creation of lineart and for colorization. In addition to much finer pointer control, they also often offer extra features such as pressure sensitivity or tilt recognition. Many image editors (e.g. GIMP, Corel Painter, Inkscape, or Adobe Photoshop) are able to make use of the pressure (and, in some cases, tilt or rotation) information generated by a tablet by modifying the brush size, shape, opacity, color, or other attributes. This page uses content from Wikipedia. The original article was at Graphics tablet. The list of authors can be seen in the page history. As with Spanking Art, the text of Wikipedia is available under a copyleft license, the Creative Commons Attribution Sharealike license. This page was last edited on 4 July 2010, at 18:18.